From my seat in Kananaskis Nordic Spa’s hottest pool, I have a dramatic view of the snow-capped peaks and pine-dotted foothills that make the Rockies legendary. It’s the kind of scenery that heals your soul a little just by witnessing it, and that makes this spot just outside Banff National Park an ideal location for a wellness retreat. When you look at the Alberta Rockies, it’s hard not to think of hot springs and hot pools. Banff National Park was established in 1885 as Canada’s first national park primarily to protect a set of hot springs that had been discovered by railway workers two years earlier. 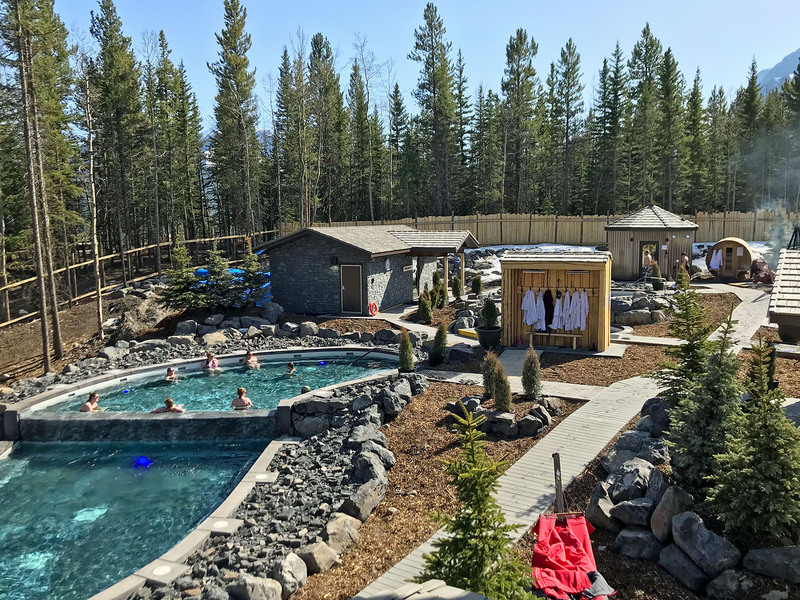 Of the many things to do in the mountains, “taking the waters” is the most traditional, so it’s a little surprising that Alberta has been left out of the Nordic spa trend that has been sweeping the rest of the country – until now. Phase one of the new spa is now open on weekends, with plans to open seven days a week by the end of June. Nordic or Scandinavian hydrotherapy is a centuries-old method of relieving stress, eliminating toxins and improving circulation. The ritual involves moving the body through a cycle: hot-warm-cold-rest-repeat. Dry and wet saunas, a heated exfoliation hut, pools of different temperatures and a variety of relaxation areas give guests options for each step of the cycle in Kananaskis. To keep it feeling more like a Canadian kitchen party than a stuffy spa, the onsite Two Trees Bistro is licensed, so guests can enjoy a glass of wine or craft beer with a meal during a relaxation cycle. Tartan robes, heated red hammocks and cowboy kettle fire pits also give the connections area a more casual feel. I have to admit, I liked the tartan robes, but I kind of missed the silence. For peace and quiet, phase two should be completed by the end of summer and will feature an indoor relaxation lounge with a darkened nap lounge, a quiet pool and a saltwater floating pool. There will also be a top floor yoga studio with hot yoga and aerial yoga on offer. Once phase two is complete, Alberta’s first Nordic Spa will be a 50,000 square-foot indoor-outdoor oasis for adults only. Its strategic location on the grounds of the Pomeroy Kananaskis Mountain Lodge, a luxury resort that is part of Marriott International’s Autograph Collection, means there is daily childcare, onsite accommodations and five more restaurant options to enjoy before or after a spa visit. The recently rebranded lodge is undergoing a massive $36-million renovation that should be complete by the end of summer. Details: Admission is $70 per day with no in and out privileges or $50 for hotel guests. Tartan robes will soon be available to rent at an additional charge. The main building is wheelchair accessible, but the pools are not.